I live in a historical home built in 1920. C and I bought it in October of 2016 and spent about four or five months renovating it. It wasn't in bad shape necessarily but it wasn't good, either. 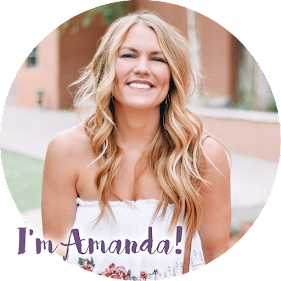 It was not tastefully updated, the yard was an overgrown disaster and there were structural and cosmetic changes that we wanted to make (knocking down walls, adding a bathroom/closet, rearranging/redoing the kitchen, bathrooms, e tc). We didn't do the work ourselves (we hired a contractor) but I did most of the design and am so proud of the way it turned out. 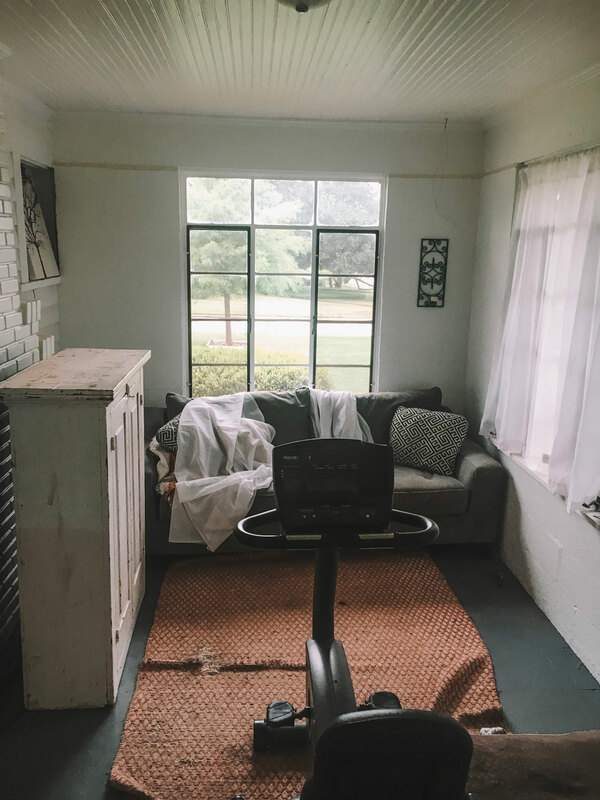 The one room that didn't turn out like we hoped was the sunroom. We tried to take the cheap and easy way out on the floors and it turned out teeeerrrrribbly. Plus, the walls were cinderblock and they just looked cold and blah. For the last two years it became "the dog's room." It has a door to the backyard so it is easy to let the dogs in and out and then lock them in there if they are wet and muddy. It is also where Kylo sleeps.....so it was always dirty. I finally had enough of it and decided to do something about it! First, we installed a vinyl click and lock plank on the floor. It is waterproof and scratch proof so the dogs can't hurt it! It's sooooo easy to clean, too. Everything wipes up in nothing flat. We got it at Lowes and it was quick and easy to install and can be installed over *some* other floors (not all....but we didn't have to tear everything up in our case). It looks like real wood at first glance and was much more affordable. I can't recommend it enough, especially for a mudroom, kitchen or sunroom. It even has a little texture to it so it isn't overly slippery. That makes it great for Kylo's bad elbows because he has a little something to grip! 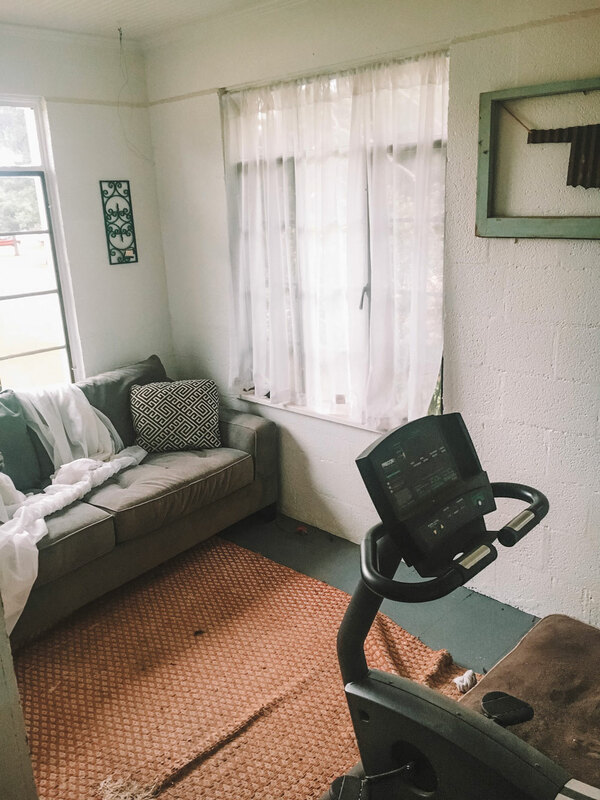 Since the walls were cinderblock, we couldn't very well just paint them, I wanted to feel less like a prison cell and more like a room. The sunroom was an addition to the house so the entire west wall is actually the house's white siding. I struggled with how to blend the siding with the rest of the room; I thought it would clash with dry wall. 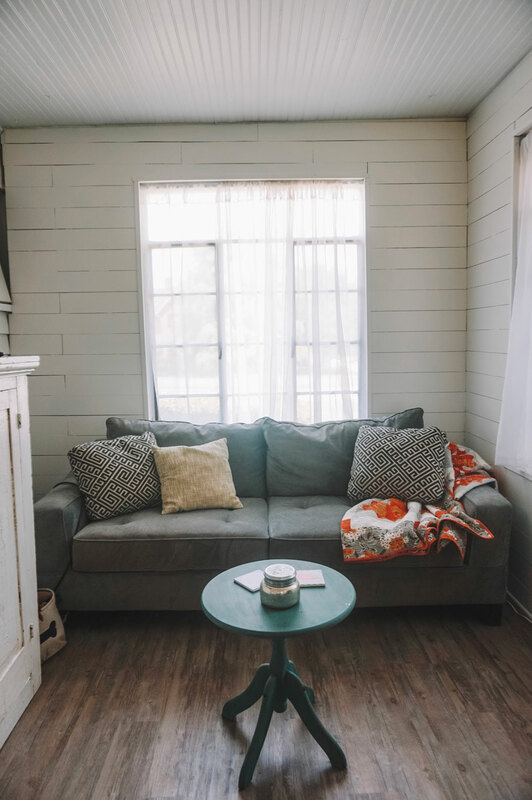 I got the idea to put up a faux shiplap to warm the room up a bit (thanks for the inspo, Joanna Gaines) and since it was slatted, it more or less matches the look of the siding. Since the house is so old, shiplap also seemed kind of fitting! It sounded easy in theory (and it was, for the most part) but it definitely took more time and elbow grease than we anticipated......all projects turn out that way, don't they?! So.....how did we create the faux ship lap? 1) I called my dad. He is the master of wood work! He and my mom came down for the weekend to help out. And by help out, I mean do most of the project. 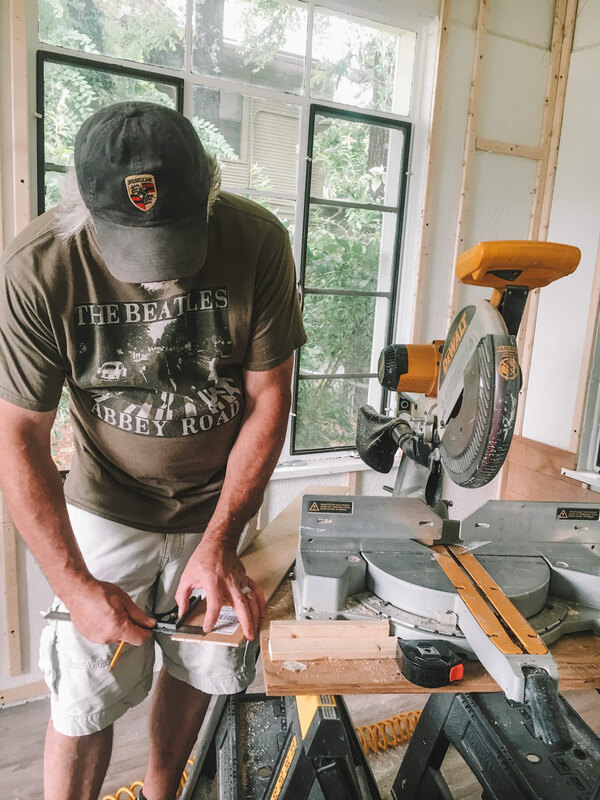 2) My dad built a frame using 1" furring strips of wood that could be nailed into the cinderblock that we could then nail the shiplap into. 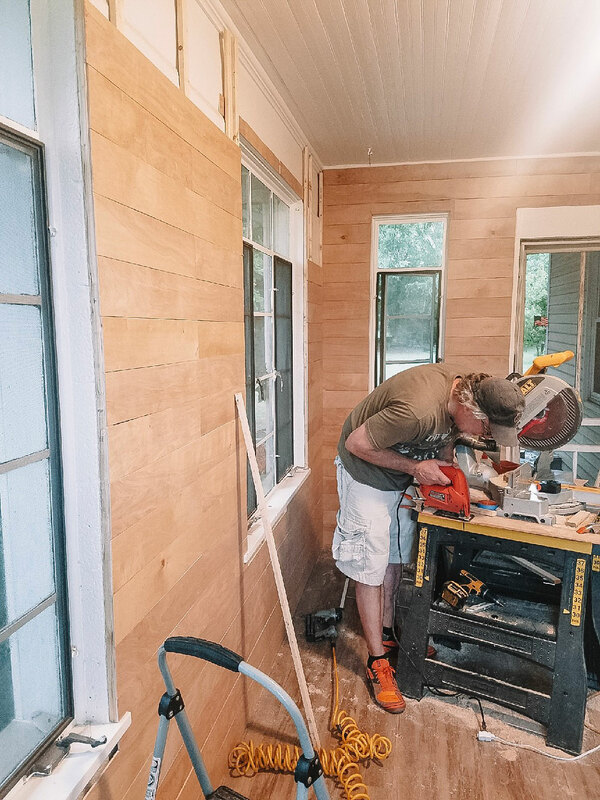 We considered glueing the shiplap straight to the wall, but that would be messy and harder to take down one day if we want to change the look of the room. This definitely took longer and cost a little more, but we thought it was the "smart" thing to do. 3) We used 1/4 inch plywood underlayment and cut it into 4" thick pieces with a table saw. 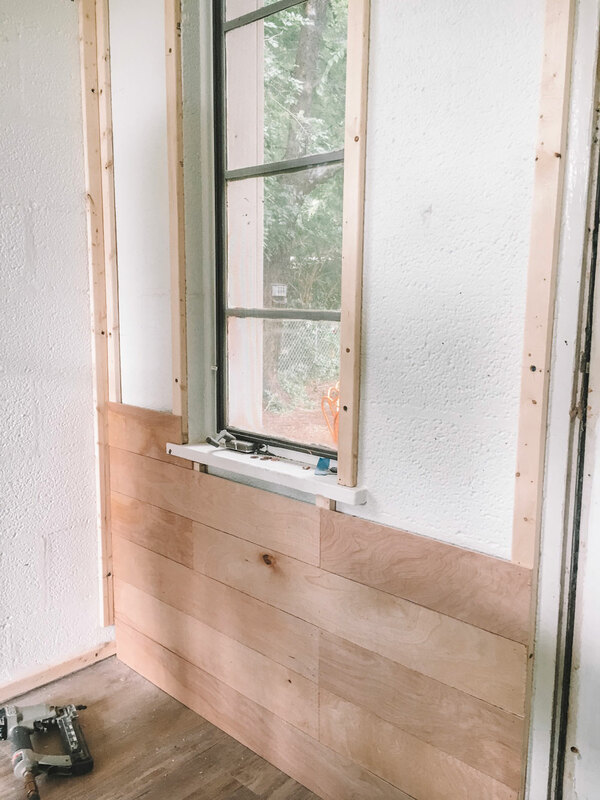 Most shiplap can be purchased at 6" wide, but we wanted the thickness to match the thickness of the siding already on one wall in the sunroom. 4. 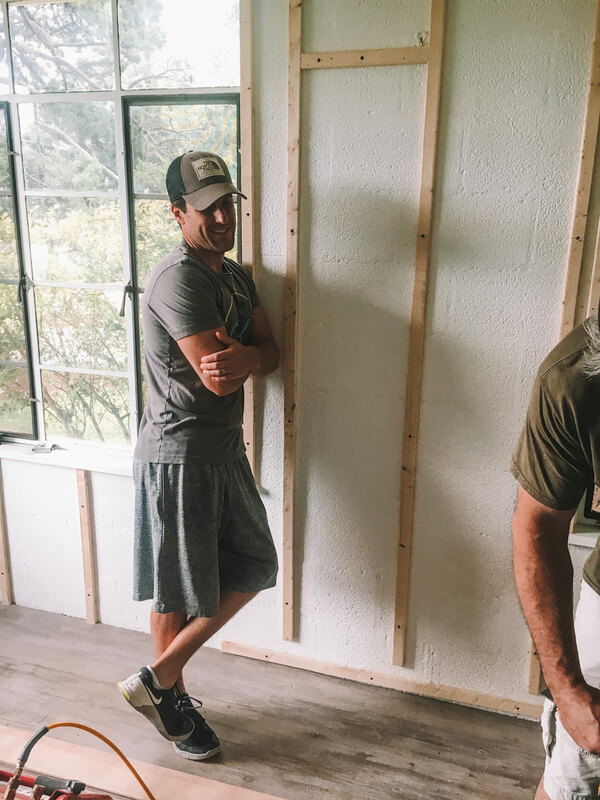 We nailed the faux shiplap pieces into the frame using nail guns. We spaced the pieces out vertically using pennies so there was a little space between each piece and varied the pattern of where pieces met horizontally. 5. We painted it using Kilz primer and Sherwin Williams Alabaster White, which is the white trim color all throughout my house. 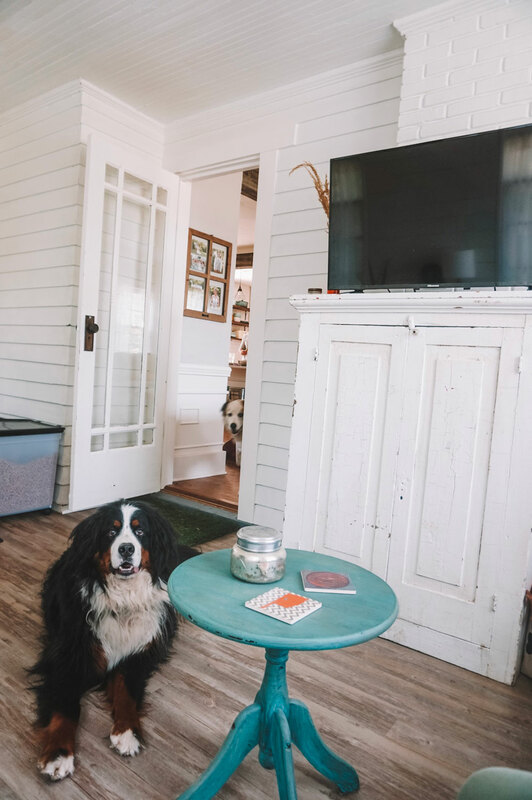 I think you can purchase pre-made shiplap that is already white, though, so check into that if you are wanting the standard 6" cut and want it to be white in the end. Honestly I loved the natural wood look, but with the wood-colored floors it was just too much wood. I considered painting it a different color, but thought white would match the siding wall best and be the brightest and easiest to compliment with other colors. Is it too much white? C thinks so, but I say there is never enough white. 6. C purchased pre-painted framing and cut it to go around the windows and doors. One more before and after for you.......really, why didn't I fix those curtains? And wallah! The wood work portion took a full weekend and the painting took about a day - one coat of primer and two coats of paint. The framing took some additional time, as well. However, though they were more time consuming, they were certainly more cost effective than buying the shiplap pre-cut and pre-painted. I still want to hang a few things on the walls, I just haven't found the right pieces yet, but I couldn't wait any longer to share! I'm finally not embarrassed to show people the sunroom when they come over. I actually like hanging out in there now, as opposed to avoiding it like the plague haha. 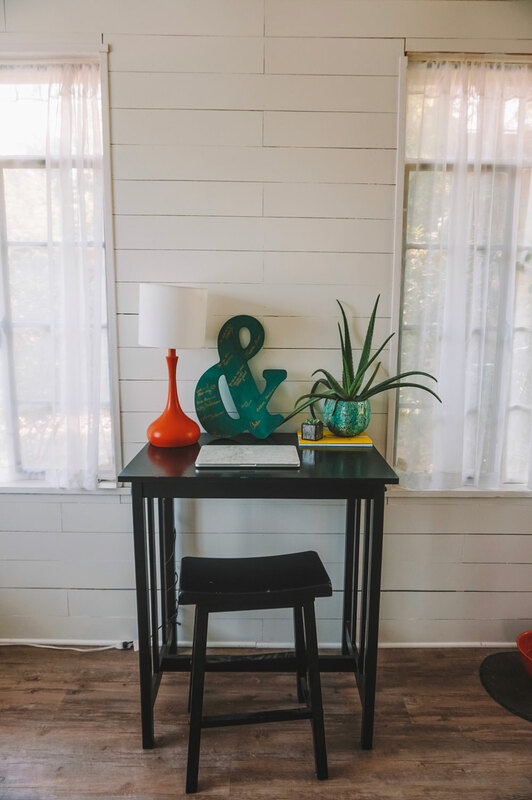 It has quickly become my blogging room and that's saying a lot because have an office, but I like the vibe of the sunroom better! Also, Kylo approves. And that's what matters! This photo shows the siding on the west wall of the house! 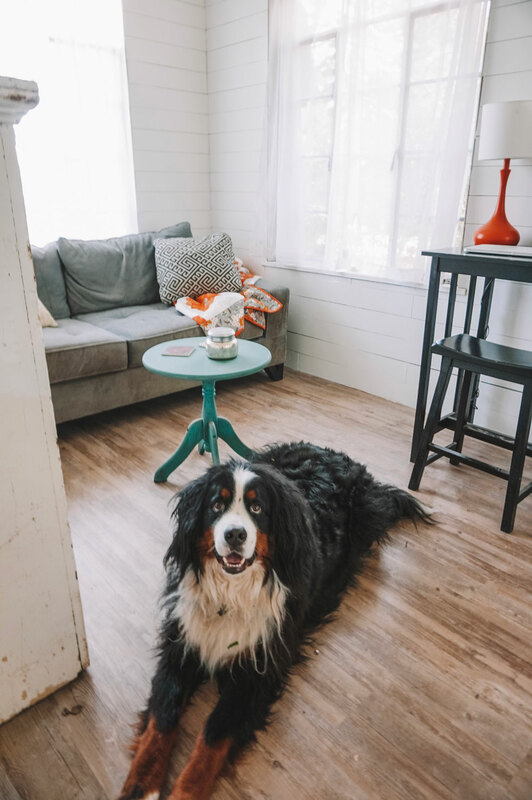 I think it matches the shiplap well, don't you? I've had quite a few requests lately to do a home tour post.......if you'd like to see the rest of my White House on the Prairie, let me know in the comments! P.S. 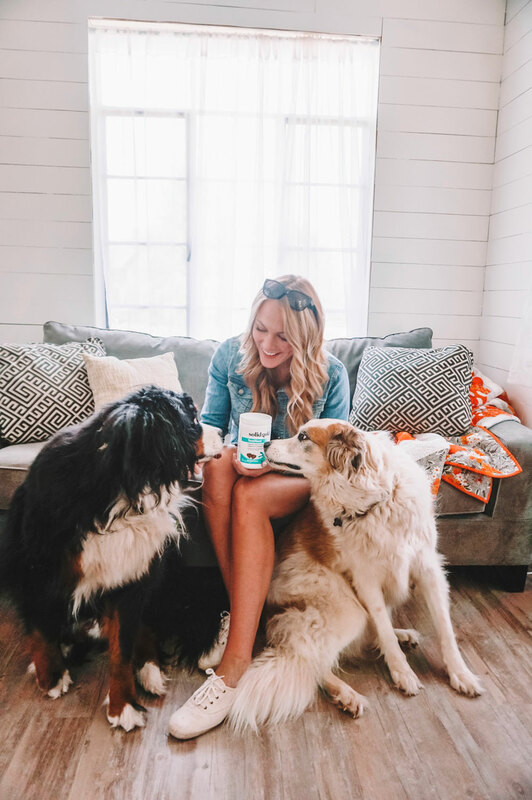 There is a giveaway going on on my Instagram today for some free Solid Gold Pet Supplements if you're interested (also Kylo approved). 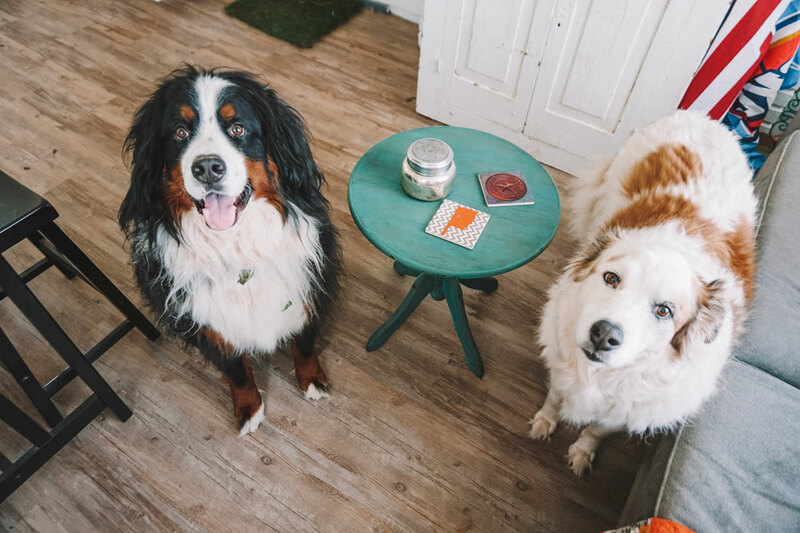 Thanks for reading and Happy Friday to you!